As soon as Apple announced the new, larger iPhones, cries went up, prompted by the sheer size of the new devices. “Will it fit in the pocket of my skinny jeans?” “How will it sit in my small hands?” “Can it double as a cheeseboard?” These valid questions are hard to answer without a tangible representation with which to test. 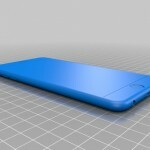 There are several 3D files available for free download from Makerbot’s Thingiverse that should help alleviate the anxiety of the larger iPhones. Simply print the files and then live with the scale models over the coming days. You might find that the larger iPhone 6 isn’t the burden it appears. Remember, select Staples stores and local print shops have been slowly adding 3D printing to their available services. There are also non-working, scale dummy phones available for purchase from Amazon and elsewhere. For around $10, buyers can acquire fake iPhone 6 or iPhone 6 Plus models that look and feel nearly like the real thing. Or, of course, you could ask any buyer of a late-model Android phone if their phone feels large, and they’ll likely smirk, quipping back that they like their super-size phone just fine.